Being a Miami girl in Alaska is hard. 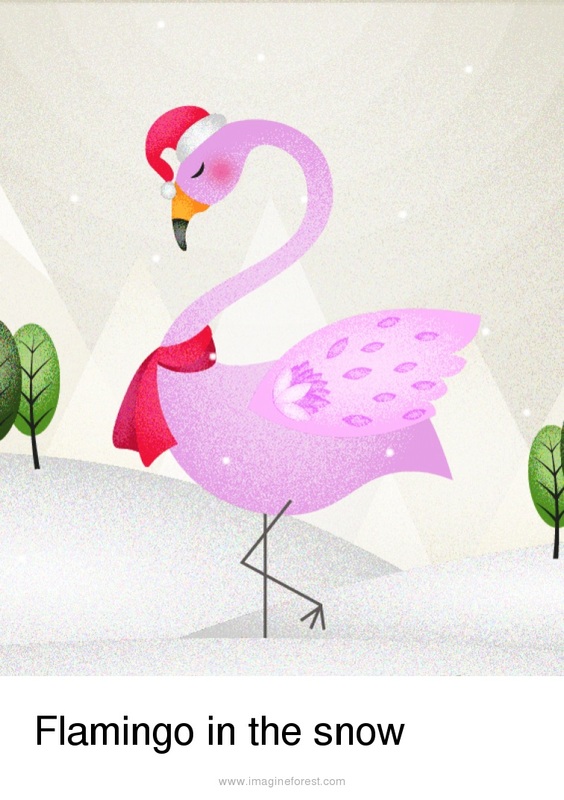 I feel like a flamingo in the snow. So out of place, so unusual and odd. How can I get other's to accept me? How can I get them to see that I am just a normal girl? It's time I embraced who I am and learned to accept it. Life is great, wonderful, brilliant! That's what I keep telling myself. "Change will be good for you." my mom keeps saying. Is it really? How could feeling like an outcast and being alone in this frozen icicle of a town be any good? Since moving to Alaska, my life has been a complete nightmare. My name is Gabrielle, everyone used to call me Gabby. I was the captain of the soccer and volleyball team back at my old school, Southwood Middle School in the sunny city of Miami. Now I'm the new girl at the Highland High School. Where everyday is a grey day. And to make things worse, my Grandma get me a pink puffy coat for my birthday. She laughed, "I think this would be the perfect gift for you...add a little colour to your life!". Pink...I used to love the colour pink. Pink sunglasses, pink dresses, pink trainers and now a pink coat! add_a_photoYou know something...I feel like a flamingo in the snow. That's exactly what I am. 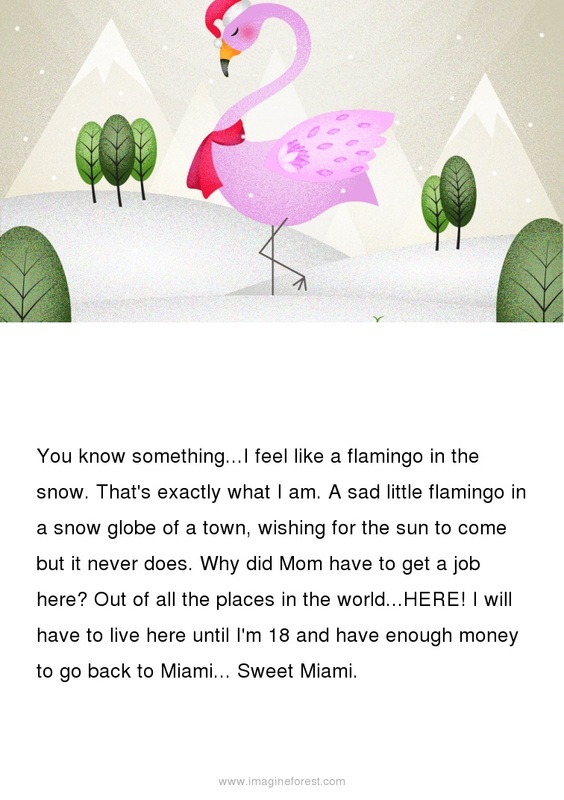 A sad little flamingo in a snow globe of a town, wishing for the sun to come but it never does. Why did Mom have to get a job here? Out of all the places in the world...HERE! I will have to live here until I'm 18 and have enough money to go back to Miami... Sweet Miami. It's halfway through the school year, so I got no chance of making friends or joining any clubs this late in the year. My game plan for the rest of the year is to go to school, keep my head down, avoid any attention and leave as soon as the clock strikes three. A little hard when you're wearing a bright pink coat! 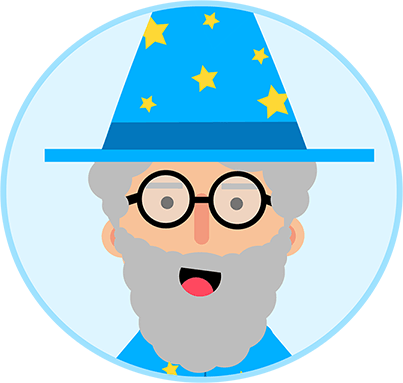 The very second I entered the school grounds on Monday morning, the first thing I heard...the first words I heard, not a "Hello" or a "Hey". It was "Look! It's a fat flamingo!" and everyone laughed. 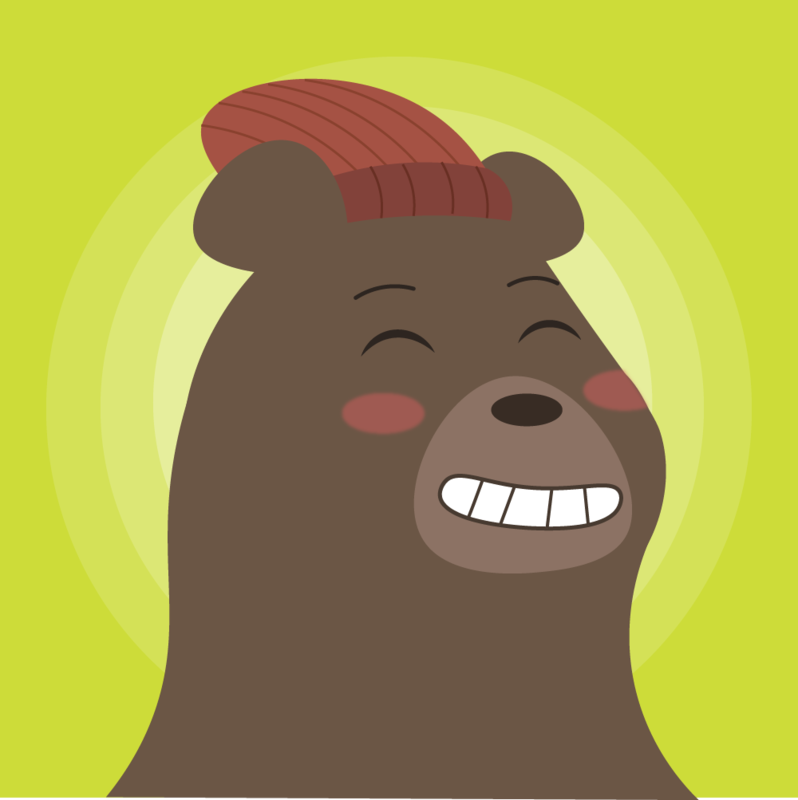 I quickly pushed past everyone, trying hard to keep a brave face on and ran straight to class. 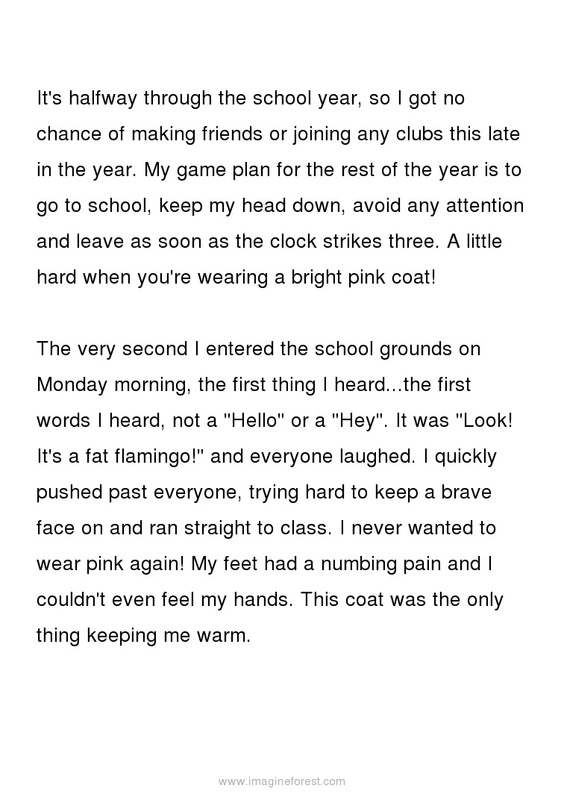 I never wanted to wear pink again! My feet had a numbing pain and I couldn't even feel my hands. This coat was the only thing keeping me warm. For the next few weeks, I kept to my plan and avoided attention the best way I could. In the meantime, I begged my Mom for a new coat, one that is black or grey. Something dull to blend in with. But we barely had enough money for our weekly food shopping, so a new coat was not an option. Mom would ask me everyday, if everything at school was okay? I would reply with a simple, "Yes, everything's fine!". But that was a lie. A big fat lie! And all mother's know when their child lies - it's what they do. 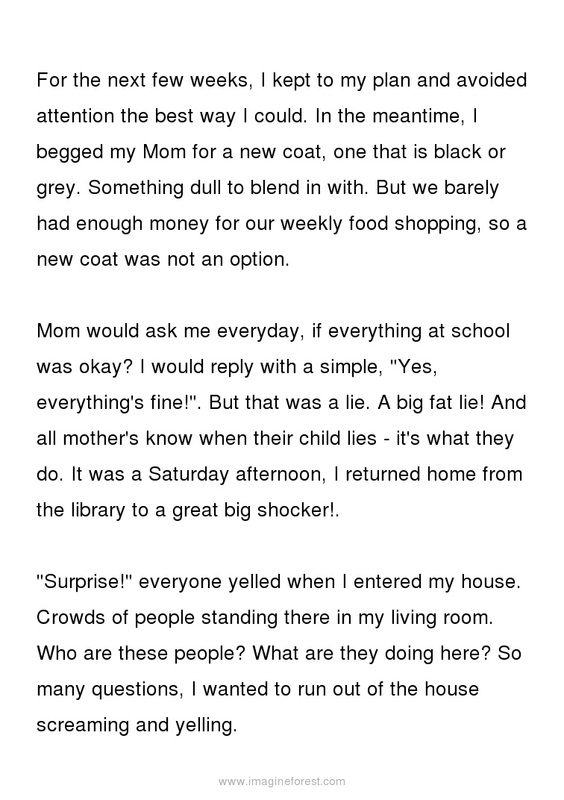 It was a Saturday afternoon, I returned home from the library to a great big shocker!. "Surprise!" everyone yelled when I entered my house. Crowds of people standing there in my living room. Who are these people? What are they doing here? So many questions, I wanted to run out of the house screaming and yelling. Just then my Mom grabbed my arm. Her grip bruising my arm just a little. "Mom, what is this?" I sniped at her. "Baby, I know how much you miss Miami, so I decided to throw you a Miami-themed party. You like?" The longest silence I ever felt and then a girl shouted, "Wow, look she really is a flamingo!" and another girl replied, "Yea, even without her pink puffy coat!" and laughter filled the atmosphere. I felt the vomit swirl around in my stomach. I could feel my face burning and my eyes watering. And barf, out it came, last nights dinner and breakfast all mashed together. "Gross, flamingo vomit!" a girl screeched in the background. The party was over. I smelled like the dead. Another proud moment to add to my book of 'Gabby's proud and embarrassing moments'. I ran to my bedroom and slammed the door shut. Never again. Never ever again will I leave this room! Through the door, I heard the faded voice of my Mom, "Please come out dear! This is very immature of you...who cares about what the other kids think...". She kept on going for hours it seemed. Then she left me in peace. Peaceful thinking...I'm a clever girl...lets think this carefully. What's my game plan for school on Monday? Thoughts whirling around in my head and soon I feel asleep. Flamingos everywhere. What? Where are my hands? Pink feathery wings! I'm a flamingo! I looked around and all I saw is flamingos. 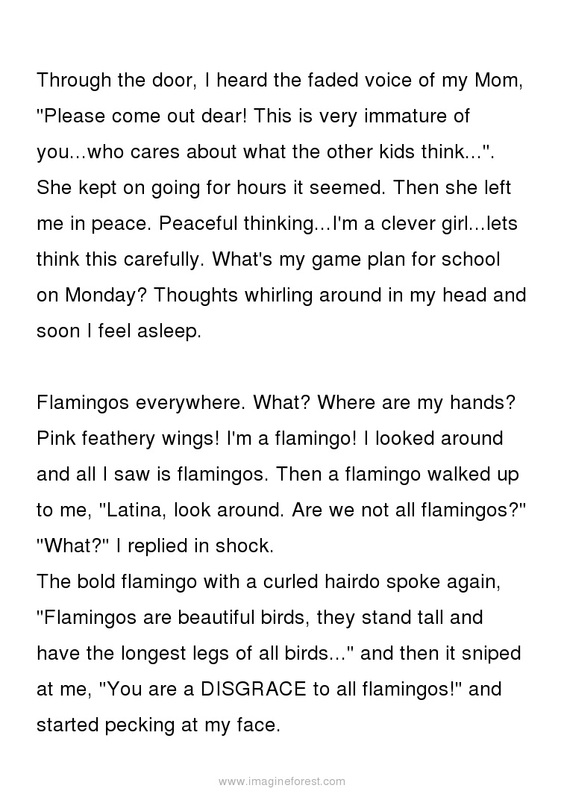 Then a flamingo walked up to me, "Latina, look around. Are we not all flamingos?" "What?" I replied in shock. The bold flamingo with a curled hairdo spoke again, "Flamingos are beautiful birds, they stand tall and have the longest legs of all birds..." and then it sniped at me, "You are a DISGRACE to all flamingos!" and started pecking at my face. I jumped up in my bed. Dry tears clinging onto my face. It was only a dream. What a weird dream. I laid back it my bed, trying to think what it all mean't. There had to be a way out, a winning solution, a big moment...anything to make me popular or at least happy. Then it came to me! Like a flash of lightening before you hear the storm. Flamingo, I'm a flamingo! I leapt off my bed with glee and rummaged through my wardrobe. I'm going all pink and proud, I shouted to myself. The next day I was strutting as I walked to school. Strutting in my new style. Big smile on my face, don't care what you say. This smile is staying on my face. "Wow, flamingo look at you!" one boy said with an evil grin. I knew what he was trying to do. 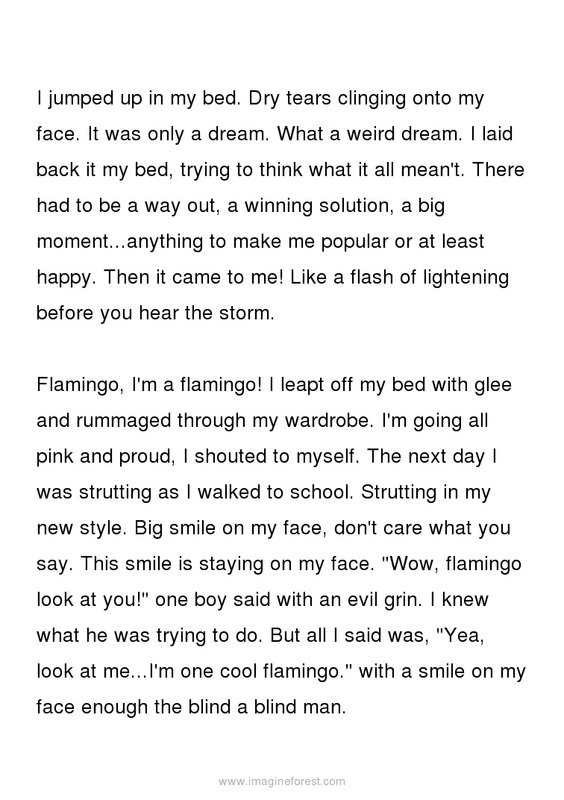 But all I said was, "Yea, look at me...I'm one cool flamingo." with a smile on my face enough the blind a blind man. On my way to class, I saw the same girls that mocked me at my party and you know what I said? "You like my Flamingo style? It's called being hot and cool at the same time!" and again the smile. They looked at me with confusion and walked away. Got nothing clever to say now, do you? For the rest of the day no one said nothing to me. Well...nothing out of the ordinary. 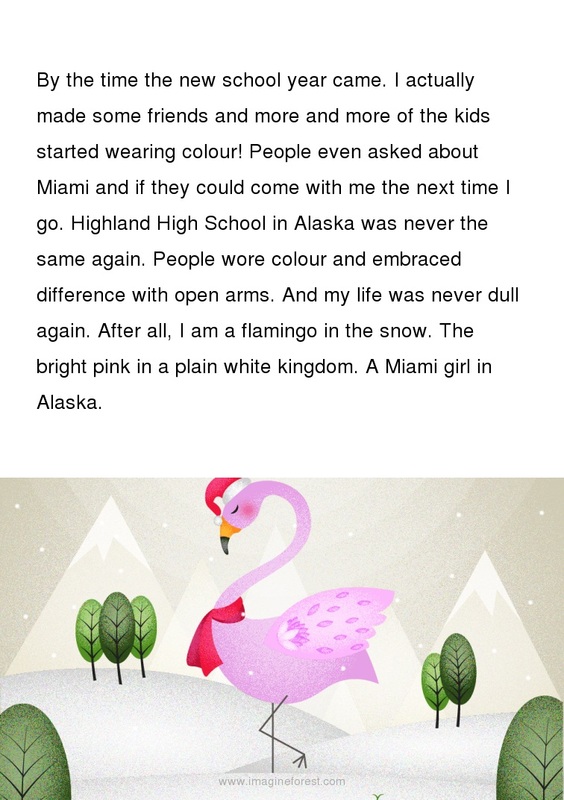 I was the Flamingo girl and that was fine with me and I was proud to be a flamingo girl and to bring some of the Miami colour to cold, dull Alaska. I even started wearing more colourful clothes to school and brought in my funky sunglasses that I wore in Miami. I was going to embrace my background and other's were going to have to accept it. Whether they like it or not.